UPDATED – WARSAW, Poland (CNS) — Catholic participants and observers criticized a “lack of ambition” by government negotiators at a U.N. conference on climate change that ended Dec. 15 with agreement on a rulebook to implement the 2015 Paris climate accord. “Many people expected a complete derailment of this conference, so the fact that countries were able to agree on a rulebook shows there’s still some spirit of commitment,” Rebecca Elliott, communications director at the Global Catholic Climate Movement, told Catholic News Service Dec. 17. “Moreover, the rulebook seems to downplay human rights, critical in reflecting the human face of climate change, which affects the most vulnerable people on earth. Their cry and that of the earth demand more ambition and greater urgency,” said the delegation’s final statement, which was released by the Vatican Dec. 19. Elliott noted that Catholic representatives, including the Vatican contingent, had “brought a moral imperative to the conversation” on the need to respond to the challenges global warming already poses to people in the world’s poorest countries. It was a perspective that rulebook negotiators discussed widely during talks that extended well into the night of Dec. 15, more than a day after the conference was to end. Another Catholic group, Brussels-based CIDSE, welcomed the final agreement, especially because an October report from the U.N. Intergovernmental Panel on Climate Change warned of “catastrophic consequences” if global warming exceeded 2.7 degrees Fahrenheit this century. “We are in a time of climate emergency — to save our planet, we will need to make drastic changes in our policies and lifestyles,” the organization said in a statement Dec. 16. “People asked governments to put transformative actions in place at this COP. 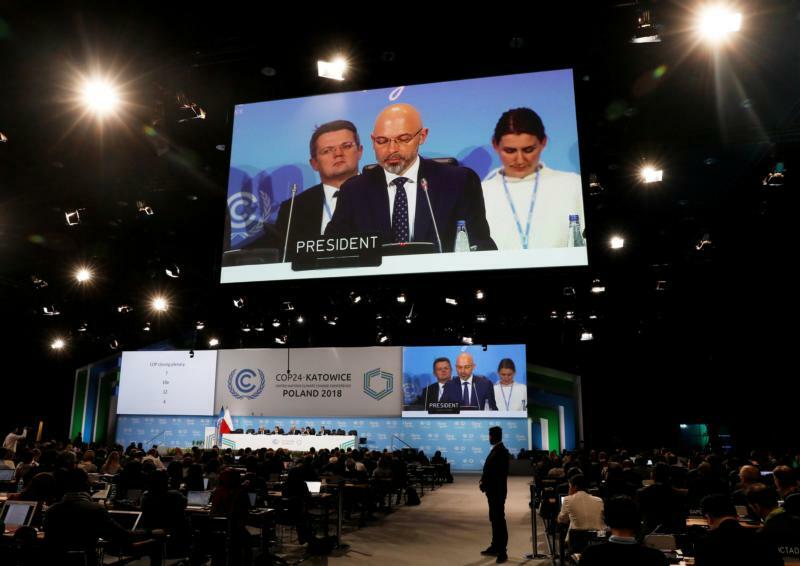 While nobody expected one conference to solve the climate crisis by itself, we did expect better than this — and we deserve better,” the statement said. Martin Krenn, policy officer with the Austrian Catholic Church’s International Development and Mission office, described the outcome in a Dec. 15 television interview as a “bitter disappointment” for not including human rights, food security and “gender justice.” He said a “comprehensive transformation of consumption patterns and production systems” was still needed to support climate-vulnerable developing countries. “Everyone — cities, local authorities, civil society groups and individuals — can and must make their contribution,” Bishop Overbeck told KNA, Germany’s Catholic news agency. “Climate justice is a moral imperative and solidarity cannot exist without humility; politicians of wealthy nations should be humble enough to recognize their duty to put the interests of others first, to understand that we share one common home,” CIDSE said. Elliott said church-linked organizations would continue following intergovernmental discussions closely and would “not forget” the U.N.’s target of reducing carbon emissions by around half over the next 12 years. “This conference has shown cooperation for the common good is still possible, and that’s what people around the world are looking for,” Elliott said.